This is a guide aimed at providing some understanding about MidiBridge (and CoreMIDI) and how to use that knowledge to your advantage to interconnect apps, hardware and network sessions. Once the basics are covered, some step-by-step recipes for connecting up less obvious situations are provided. The above applies to MidiBridge 1.3 and earlier. As of version 1.4, background processing is on by default (with a 15 minute idle timeout). The idle timeout value can be changed in the Options tab of the Preferences page. Setting it to 0 minutes turns backgrounding off completely. Just because an app doesn't advertise any ports of its own doesn't mean that it can't be controlled via MidiBridge! MidiBridge can route events from any of these types to any other type, but the routing must be between a source and a destination from MidiBridge's point of view. To connect source A to destinations B and C, you touch input/source port A on the left and then touch B and C on the right and green lines will be drawn between them to show they are connected. Touch port A again to tell MidiBridge you're done interconnecting to that port. 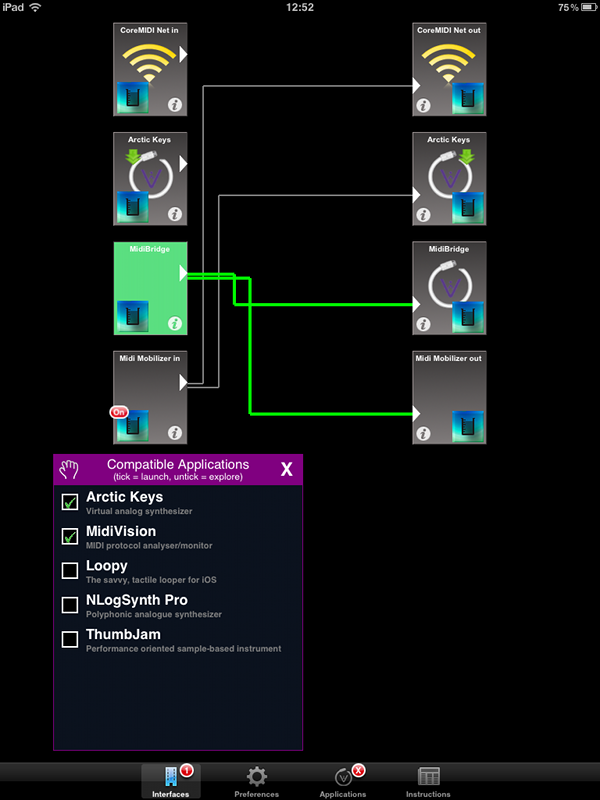 The Fast-switchable Applications Panel (As of version 1.4, this panel has been renamed from 'Compatible Applications') tells you that both Arctic Keys and MidiVision are installed on this device, but Loopy, NLog and ThumbJam are not (can't afford them). Touching Arctic Keys on the App Panel will fast-switch to Arctic Keys (since we know that is running). Touching MidiVision on the App Panel will launch MidiVision (not currently running, but installed). Touching any of the other apps in the App Panel (the unticked ones) will redirect you to the App Store to see if this app is of any interest to you. IMPORTANT: The Fast-switchable Applications panel is for fast-switching compatibility only. It is not an indicator of an app's MIDI connectivity. The App Panel can be dragged around the screen using the top bar of the panel. It can be dismissed by either pressing the 'X' at the top of the panel or touching the 'Applications' tab that has a badge marked 'X'. An input from MidiBridge's view is a source of MIDI events from other apps, physical devices or the CoreMIDI network. An output from MidiBridge's view is a destination that MIDI events can be sent to and can be other apps, physical interfaces or the CoreMIDI network. Apps can either generate MIDI events, receive MIDI events or do both. The app advertises its own virtual destination and accepts input from it. Examples: Animoog and Sunrizer. Categories 1,2 and 6 are easy. You just connect your desired source/destination to the app's virtual port in MidiBridge and away you go. You may need to tweak something in the other app to tell it you want it to accept/send MIDI on its virtual ports (and tell it to continue working in the background). Category 3 apps will not show up as a separate port in MidiBridge, but will read from MidiBridge's virtual output. To control these types of apps, just connect your desired source to the MidiBridge destination. Category 4 apps are the reverse of category 3. They don't show up in MidiBridge but to use them as sources, you connect MidiBridge's virtual source(input) to the destination you want the events to go to. Finally, category 5 apps require a little trick to make them work. In MidiBridge prefs, enter the word 'localhost' (without quotes) in the CoreMIDI Network Destination field and press the Connect button. You can also choose 'Connect Automatically' to re-start the connection when MidiBridge launches. Essentially you are hi-jacking the CoreMIDI network to run like a virtual port. To send events to the app that supports CoreMIDI network, you connect a source to the CoreMIDI net destination. Vice-versa for receiving events into MidiBridge from a category 5 app. Now you know how to interconnect different types of apps, what about the order in which you launch the apps? It all depends upon when each app refreshes its view of the CoreMIDI world. MidiBridge for example refreshes its view when it starts, when it is returned from the background, when a physical device is connected/removed, when a virtual port appears/disappears and when a CoreMIDI network session starts/stops. Basically all the time. What's more is that it will automatically re-establish any prior connections that you had set for that port. So far, so good. Launch MidiBridge first, so that its virtual ports are available if need be. Launch category 3 apps (SampleTank, Sunrizer XS) so that they add MidiBridge's virtual destination to the list of ports they'll receive events on. Launch category 4 apps (SoundPrism Pro) so that they add MidiBridge's virtual source to the list of ports they'll send events to. Launch any other apps that advertise their own inputs or outputs. Unfortunately the world isn't perfect and sometimes even these rules are not enough. If it doesn't work, you may need to switch to certain apps as well to re-invogorate their engines. It's not exact and some trial and error may be involved. Sorry, as of Nanostudio 1.33, this trick no longer works. We have been in touch with Blip Interactive and hopefully will be able to work something out. With a little trickery it is possible to use MidiBridge to give NanoStudio a virtual input so that it can be fed MIDI events from other apps. Please note that NanoStudio works in the foreground so any app that is to be used for driving it must be in the background. Note also, that the order of these steps is crucial to work around the way in which NanoStudio manages CoreMIDI. First either reboot your device or terminate all MIDI related apps including MidiBridge and NanoStudio using the task manager. Also, unplug all physical MIDI devices. Start NanoStudio first, as it resets the CoreMIDI networking facility in iOS which breaks any other CoreMIDI Network sessions. Setup your patch for Eden/TRG. Press the Home button and now launch MidiBridge. Enter the word 'localhost' (no quotes) in the 'CoreMIDI Destination Host/IP Address' field. If all is well, there should be a little '2' over the Interfaces tab button and the CoreMIDI Net interfaces should be highlighted in yellow. Fast-switch to NanoStudio from MidiBridge's Applications panel. Now connect your physical MIDI interface and route it to MidiBridge on the right (if you also want to control NanoStudio externally) or to the other app which is controlling NanoStudio or even to FreEWI if you're mapping channels and the like. Remember that NanoStudio will not pick up the physical interface - which is what we want. The above steps don't really appear to do much, but they are crucial in cementing the fabric to make NanoStudio only respond to the (now looped back) network port without picking up the physical interface. Now launch the app you wish to drive NanoStudio with. If it is OMAC fast-switchable then you can launch it from the Applications pane in MidiBridge. Configure the app to send MIDI events to 'MidiBridge' and start the app playing. Double-tap the home button (or fast-switch if the app has OMAC fast-switching capability) and switch back to NanoStudio which should now spring into life! First start MidiBridge. The only connection needed is from 'MidiBridge' on the left/source to 'MidiBridge' on the right/destination. As always, make sure 'Run in Background' on the Preferences pane is set to 'On'. Finally start BeatMaker 2 and make the following adjustments by pressing the 'i' (info) button and choosing 'MIDI SETUP'. Turn all inputs OFF (to prevent infinite MIDI loops). Turn off all outputs except MidiBridge. Press the 'OUT' button at the bottom so it is lit up. Now when you play in BeatMaker, Animoog will sound. Here are two step by step guides for the 'tricky' apps like SampleTank and SoundPrism. Make sure that the app will continue in the background. In SampleTank the word 'On' must be red! Make sure that MIDI On/Off is 'On' in SP preferences. On one of the devices, (lets call it A), go to the Settings app of the device. Select 'General', then 'Network', then 'WiFi' and then click the accessory button on the network you are currently joined to. Make a note of the IP address. On B, start MidiBridge and enter the IP Address you wrote down in the 'CoreMIDI Destination Host/IP Address' field and then press the Connect button. Both devices should let you know a connection has been established. On device A (for example) connect your event source to the CoreMIDI Net out destination. On the other device, connect the CoreMIDI Net in source to the destination port you want to exert control over. NB. Both devices must be connected to the same Wi-Fi network, in case that isn't obvious. The 'Fast-switchable Applications' Panel - or what is OMAC and why do I care? OMAC stands for Open Music App Collaboration and is a group of iOS music app developers who are working together to create unofficial standards for music apps in terms of MIDI and audio interaction. One of the prongs of this is the OMAC App Registry for app fast-switching where users can rapidly switch to other music apps without using the Home button from within the app itself. Audeonic is committed to this and hence as of MidiBridge version 1.3 (and MidiVision 1.5) a 'Fast-switchable Applications' panel has been added that lets you fast-switch or launch OMAC compatible applications. Just because an app doesn't feature in the OMAC 'Fast-switchable Apps' list doesn't mean that it can't be controlled via MidiBridge! The list shown in this window has little to do with MIDI connectivity and much to do with fast-switching. The list shows all fast-switchable apps available for the device and, if they are ticked, then touching that app's entry in the list will launch or switch-to that app. If the app isn't ticked, then the app is not installed on the device and touching the app's entry will take you to the App Store to see if that particular app is of interest to you with the knowledge that if you do install it, you'll be able to fast-switch/launch it from MidiBridge directly. Again, do not let yourself be confused by what this panel stands for. It is only for fast switching and an app's absence from this list does not mean that MidiBridge cannot send/receive events to/from it. If your favorite app isn't on the list, then please let the developer know. Full details on what they need to do are at the google group 'Open Music App Collaboration' in the 'Introducing OMAC Registry' thread here. The amazing people at iDesignSound, MusicApps.com.br and Tim Behrens have all made videos showing MidiBridge in action. Here are the links, and thanks to those above for making the movies. MidiBridge & SynthStation25 Allows Control of any CoreMIDI iPhone App! MidiBridge + Akai SynthStation25 = Wireless MIDI Controller Keyboard!